Hello members, welcome to week 15! This week’s title comes from a Flaming Lips song called “Waitin’ For A Superman.” I suggest you check it out on Youtube. The arrival of celery in the share last week inspired us to find a vegetable stock recipe, and two simple soups that you can then use the stock with. We also found an Autumn themed salad that calls for Michigan pears, and some mini omelettes that are great for using up leftover veggies. 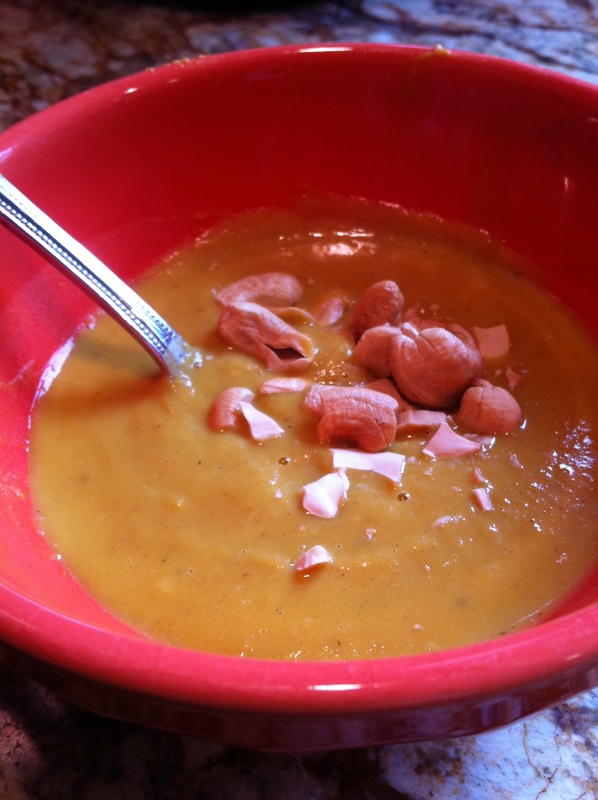 This recipe comes from a cooking class I took on soups and stocks. 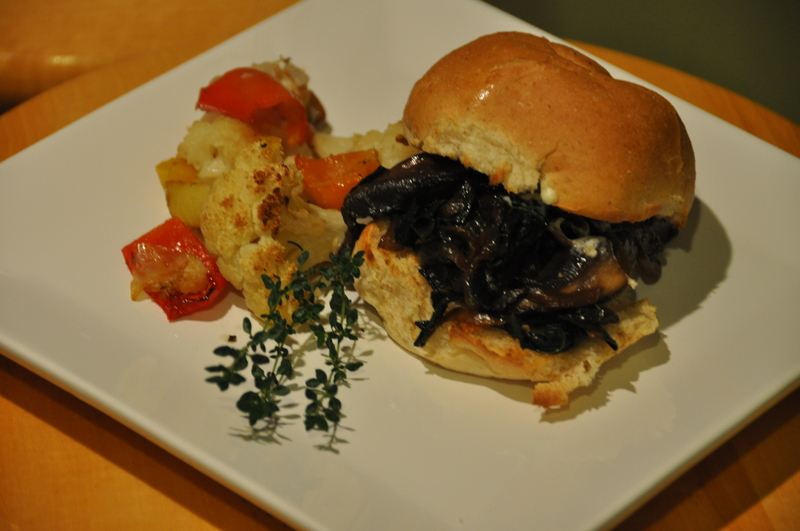 Chef Jim LaPerriere was the teacher, and his recipe credits the CIA Professional Chef Book. 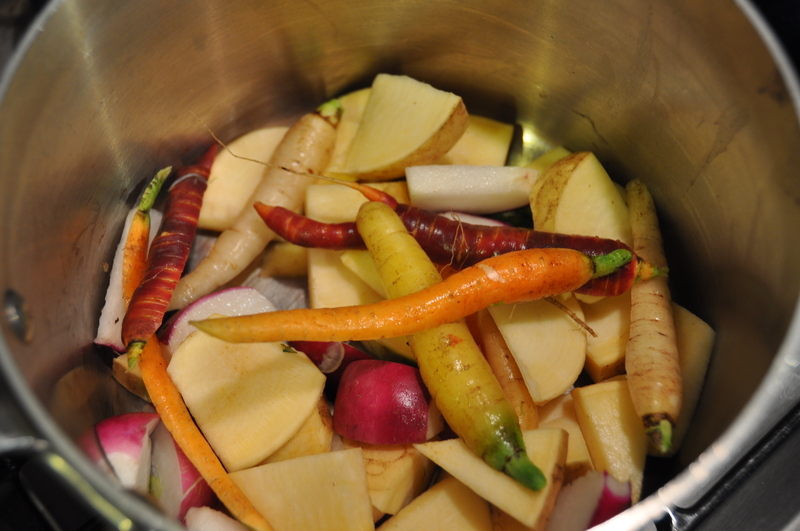 There are many variations you can make on vegetable stock, and because veggies yield their flavor sooner than meat bones, you can make vegetable stock in about an hour. That means you can try several stocks in an afternoon and freeze them for winter soup later. Yield: 1 quart veggie stock, consider double or triple the recipe if making stock to freeze. 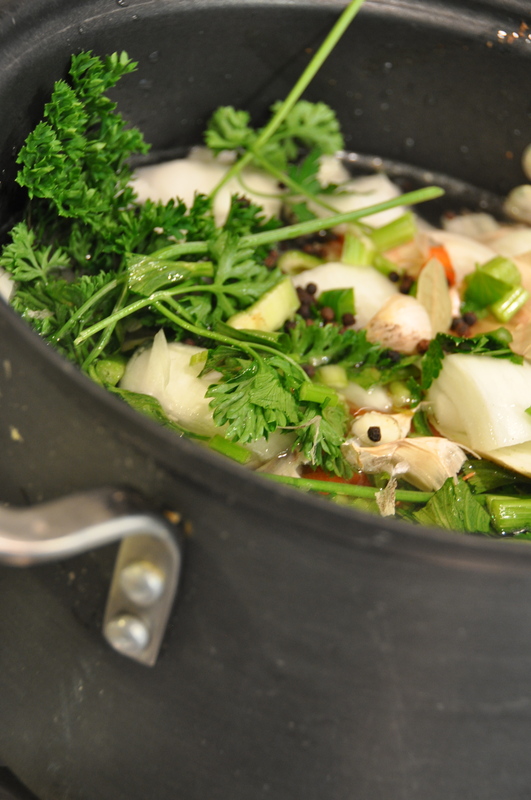 Heat oil in a soup pot, and add vegetables. Cover and sweat the vegetables 3-5 minutes. Add the water and sachet; simmer for 30-40 minutes. Strain the stock. It is ready for soup-making now, or you may cool it and freeze for later use. Try variations: use parsnips in place of carrots, try more or less celery, add fennel fronds or ginger to herbs. Also try roasting veggies first before simmering with water for a roasted flavor. For the dressing: try a combination of 2/3 cup poppyseed and 1/3 cup balsamic vinaigrette. In a large bowl, combine lettuce, pears, cranberries, pecans, bacon, and feta. Serve in fancy salad bowls if you’re feeling fancy, or regular bowls work fine too. Preheat oven to 400 degrees. Spray a muffin tin with cooking spray. 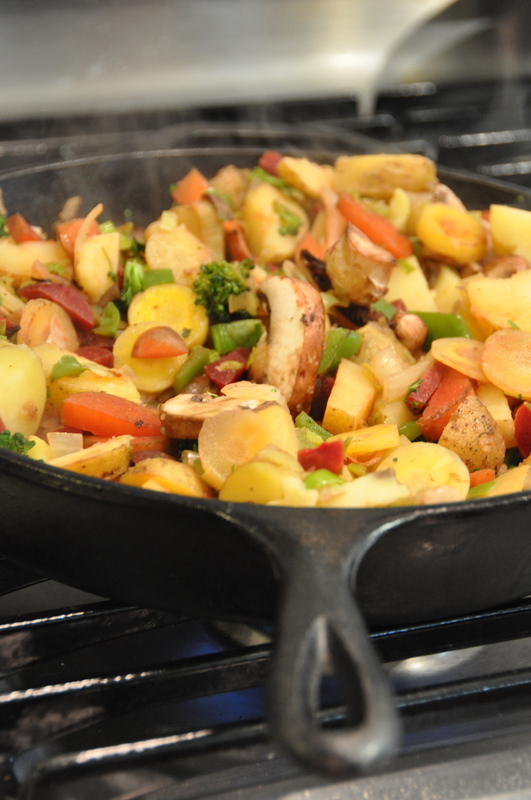 Chop all vegetables, saute in a skillet with the olive oil, about 3-5 minutes. Whisk eggs together in a mixing bowl. 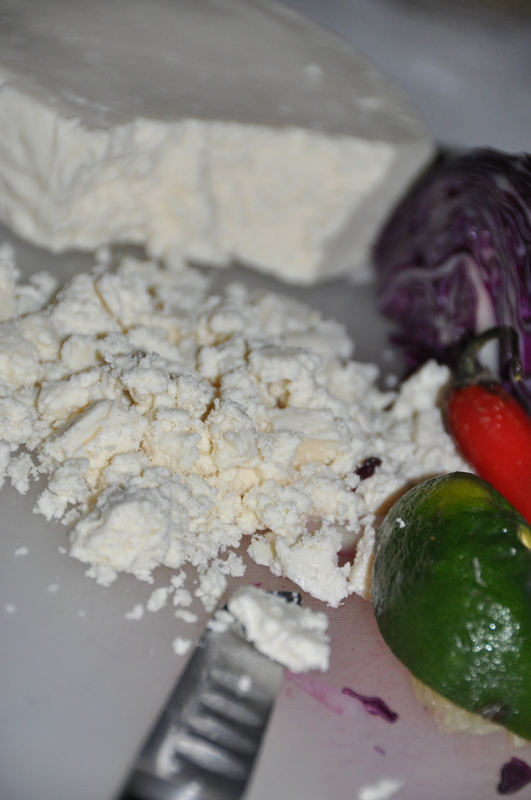 Pour vegetables into egg mixture (and cheese if using). 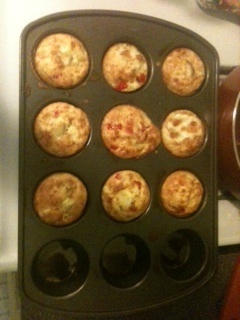 Pour mixture into muffin tin cells. Bake 20-30 minutes, or until liquid is cooked off the eggs. Enjoy warm or put into freezer bag for convenient meals later. If freezing, microwave omelettes for 2 minutes to reheat. This recipe calls for 2 lbs. of carrots, which is about 2 bunches from CSA pickup. If you are short, consider halving the recipe. Or head on down to Holland or Fulton St Market and get some more Groundswell carrots. Each rainbow bunch is lovingly crafted by a hardworking Groundswell employee. Place oil in a large pot over medium heat. Add carrots, onion, garlic, thyme, and rosemary. Cook for 15 minutes until carrots are fork tender. Remove herb sprigs, transfer vegetables to a blender or use an immersion blender to puree. Add broth, continue to puree. Transfer to large saucepan over medium heat, add bacon strips. Season with salt, pepper, and hot sauce. Simmer until ready to serve. Serves 6. For toppings: fresh basil, cilantro, or mint, coconut milk, brown sugar or agave. And Sriracha hot sauce for an extra kick. Dice onion and garlic, add to pot with 1 Tbsp coconut or olive oil. Add carrots and cook for 5 minutes. Season with salt and pepper, add veggie stock and water, stir. Bring to a low boil, reduce heat to a simmer. Cover and cook for 20 minutes, or until veggies are tender. Transfer to blender or use an immersion blender, blend until smooth and creamy. Add peanut butter and chili garlic sauce, blend. Taste and adjust seasonings as needed. You may add brown sugar or agave for sweetness. Serve with fresh basil or herbs of your choice. 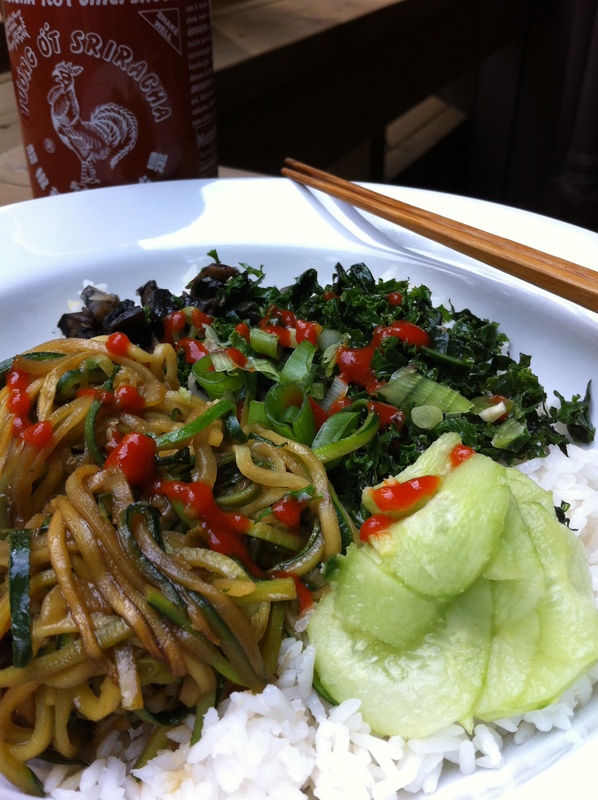 Drizzle with coconut milk, or add Sriracha sauce for extra heat. Greetings members, did you enjoy the bag of potatoes in the share last week? We included 2 potato recipes this week. Did you enjoy all the bell peppers in the share last week? We’ve included a stuffed bell pepper recipe. Also, a tomatillo salsa recipe that calls for sweet corn, and a kale salad variation that uses tomatoes. Bake the potatoes, preferably the night before: preheat oven to 350 degrees, poke potatoes with a fork a few times, wrap in tinfoil and bake for one hour or until easily pierced with a fork. Let cool, place in fridge. The day of soup making get them out and slice into 3/4 inch chunks. Heat the olive oil in a pan over medium-high heat, add the onions and cook until brown. Then add garlic, fennel, thyme, sage, salt and pepper. Cook for 2 more minutes, then add wine to deglaze the pan. Add the potatoes and broth, cover, and lower the heat. Bring to a low boil. Mix in the kale, cook 15 to 20 more minutes. Use a potato masher to mush up half the soup, but do not use an immersion blender. Add the soy milk and stir. Ladle into bowls and enjoy. Lately I have found that preheating the baking sheets helps give a crispy texture to the potatoes while also preventing them from sticking to the pan. I learned about this at a cooking class from Jim LaPierre, a chef from the Saugatuck area. Wash and slic the potatoes into wedge/fry shapes. Soak in a mixing bowl with water for 10-15 minutes. While soaking the potatoes, put 2 baking sheets into the oven and preheat to 400 degrees. When the potatoes have soaked, pour them out and spin dry in a salad spinner or pat dry with a towel. Toss them in a new mixing bowl (or dry the other one and re use it) with olive or grapeseed oil, 1/2 tsp salt, 1/4 tsp pepper, and crumble 1/2-1 tsp of dried herbs over them. When the oven has preheated, put your oven mitts on like you are Muhammad Ali getting ready for a fight. Quickly take the heated baking sheets out and place on the stovetop. Transfer the potatoes, half to each sheet. They will sizzle! That’s ok. Put them back in the oven as fast as you can. Roast them for about 20 minutes. In our oven the tray in the middle is usually done, and I put the top tray on the middle rack and roast it another 5 minutes. Divide one tray’s potatoes between two plates, add ketchup in the preferred method (pool on the side or Jackson Pollock painting) and enjoy. Put the second tray’s potatoes into leftover containers, eat them the next day while thanking our ancestors for finding starchy root vegetables. This recipe has some ingredients you can leave out (celery and greens) or substitute, or make again when Groundswell celery comes in! Also consider substituting Groundswell tomatoes for canned. 4 large red bell peppers, or their equivalent in small, medium, purple, green, etc. Cut in half with seeds removed. Heat olive oil over medium high heat in pan. Add the onion and celery, cook 5 minutes. Add cumin and garlic, cook 1 minute. Add greens and tomatoes, cook 5 minutes or until most of the liquid has evaporated. Add black beans, quinoa, and 2 cups of water. Cover, bring to a boil, and reduce heat to medium low. Simmer for 20 minutes or until quinoa is cooked. Optional: add 1 cup of cheese. Heat oven to 350 degrees. 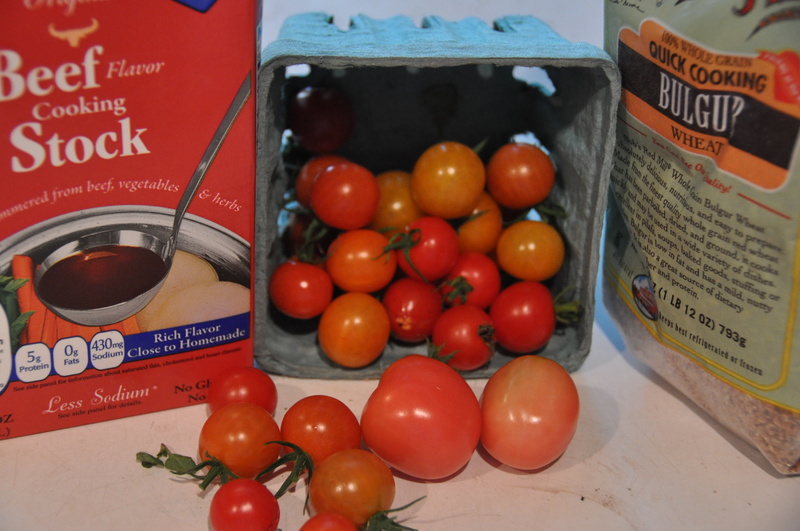 Pour liquid from tomato cans into a baking dish. Scoop about 3/4 cup of quinoa into each pepper and place in baking dish. Cover with foil and bake 1 hour. 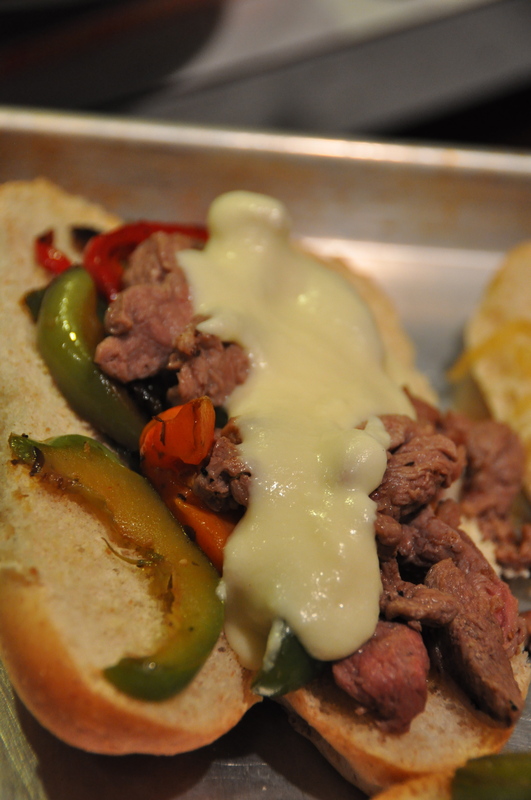 Remove foil, sprinkle 1 tbsp of cheese on each pepper if desired. Bake 15 minutes or until pepper tops look browned. Remove peppers, let stand 5 minutes, and serve. Saute onion and garlic in the olive oil over medium heat until soft. Add lemon juice, zest, honey, and salt and pepper to taste. Add the bell pepper, cook for 1-2 minutes to reduce the lemon juice slightly. Add the kale, toss in the pan, remove from heat after 1 minute or when kale has begun wilting. Serve with crumbled feta. Place tomatillos in microwavable bowl, microwave on high for 2 minutes. Put in freezer 10 minutes to cool. Coat non-stick skillet with cooking spray, cook corn over medium high heat for 2 minutes. Transfer to bowl, put in freezer 10 minutes to cool. Combine cilantro, Jalapeno, and lime juice in a bowl. Add tomatillos and corn, mix well. Salt and pepper to taste, serve with tortilla chips. Tio Tommy and the Tomatillos! Indie bands take note: This blog title can be used for a band name, exclamation point included. Tomatillos are new-er to the share, and may be new vegetables to some members. This week we’ve included 2 tomatillo recipes, a vegan beet dessert (double the recipe to use more beets! 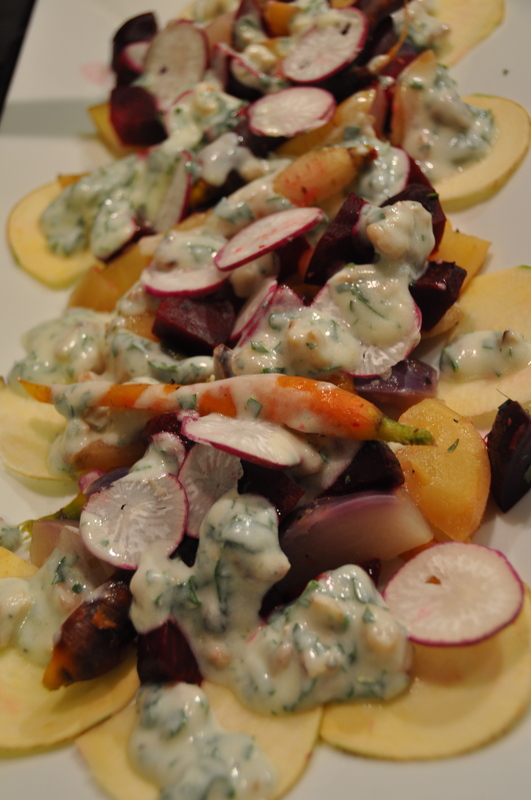 ), and variations on summer salads that would be great at upcoming Labor Day picnics. In a small mixing bowl add mayo, lemon juice, salt and sugar. Whisk until well combined. In a medium serving bowl add the carrots, pineapple, raisins, and pecans. Pour dressing mixture over and toss until well combine. 1 lb. bow tie pasta, cooked al dente (usually one minute less than suggested time on box). 8 oz of Spinach, or salad greens, chinese cabbage, bok choy, etc. Options to add from the share, try one cup of: grated carrots, grated radishes, chopped scallions, etc. Combine dressing ingredients in a blender or processor until thoroughly mixed. Pour over just finished pasta, cover and allow to rest a few minutes. The dressing will stick to warm pasta better than cold. Add spinach (or other chopped greens) to mixture and let sit a few minutes. The warm pasta and dressing will lightly wilt the spinach, soaking in the flavor. Add the mandarin oranges, nuts, chestnuts, carrots or radishes and toss. dipping ingredients: tortilla chips, pretzels, sliced carrots, cucumber, bell pepper, etc. Heat oven to 375 degrees. Line a baking pan with aluminum foil. Toss tomatillos, peppers, and garlic in the olive oil with 1 tsp of salt. Transfer to foil pan, roast for 20 minutes or until the skin of tomatillos and peppers begins to blister. Remove from oven and let cool for a few minutes. Transfer the roasted veggies to a blender or processor, or a large mixing bowl with an immersion blender. Blend/pulse until pureed. Add cilantro and goat cheese, blend/pulse to incorporate. season with salt and pepper if needed, serve with dipping media. Combine all ingredients in a small mixing bowl, serve with tortilla chips. Note: We recommend you taste a tomatillo raw before starting this recipe. Some people find un-roasted tomatillos to be very tart. If this is the case, you can roast your tomatillos, which will change their texture but decrease their tartness. Also, if you’re low on tomatillos you can supplement with salad tomatoes. Preheat oven to 375 degrees. Remove the stem and tail from the beets, wash until clean. Wrap beets in aluminum foil, drizzle a little oil over them, wrap tightly and roast for 1 hour or until tender when prodded with a knife. Set in bowl in refrigerator to cool. Once cooled, either finely grate or puree beets in a blender (add water or orange juice to encourage mixing). Measure out 1/2 cup and set aside. Whisk together almond milk and vinegar, set aside for several minutes to curdle. Add sugar, oil, and 1/2 cup beets and beat until foamy. Add flour, cocoa powder, baking soda, baking powder, and salt to a sifter. Slowly sift into wet ingredients while mixing with a hand-held or standing mixer. Beat until no large clumps remain. Pour batter into liners, filling to 3/4 full. 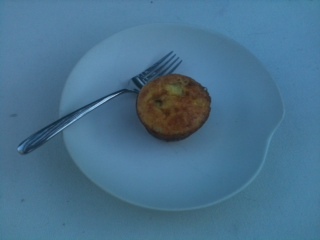 Bake 22 to 25 minutes, until a toothpick inserted in the center of a cupcake come out clean. Transfer to a cooling rack and let cool completely. Do not try to unwrap them or they’ll stick to the wrapper. Once cooled, dust with cocoa powder and store in an airtight container to keep fresh. http://www.groundswellfarm.org/wp-content/uploads/2018/02/Groundswell-Farms-Logo-v6-1030x321.png 0 0 Steve Whittington http://www.groundswellfarm.org/wp-content/uploads/2018/02/Groundswell-Farms-Logo-v6-1030x321.png Steve Whittington2014-08-17 20:32:282014-08-17 20:32:28Tio Tommy and the Tomatillos! The Bibimbap is oh, so Bibimgood! This dish is my favorite recipe this summer, hands down. Bibimbap is a signature Korean dish. The word literally means “mixed rice”. Traditionally it is served as a bowl of white rice topped with sautéed vegetables, chili paste and sometimes beef or another meat. The whole dish is then topped with a runny fried egg. 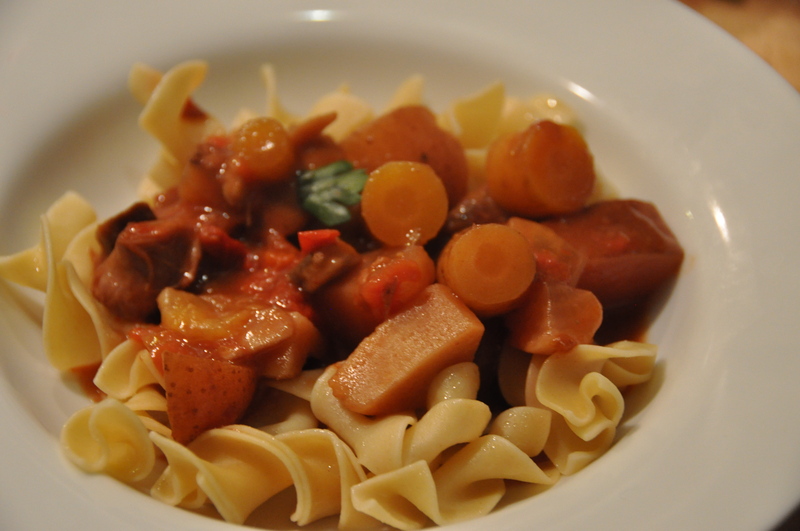 It is a creative way to use your “leftover” veggies and meat of the week in a most tasty dish! This recipe is a vegan version, but you can be as creative as you wish (using brown rice instead of white, or adding tofu, cooked meat and/or a fried egg on top). In a small bowl, combine the vinegar with the sugar, salt and 1tsp ginger, toss with cucumbers and set aside in fridge to marinate. In a medium saucepan, cook the basmati rice per the instructions, until tender. Remove from heat and let stand for 5 minutes, fluff with a fork. In an iron skillet or nonstick skillet, heat 2 Tbs of the peanut oil. Add the garlic, and portabellos, season with salt and cook over high heat, stirring, until browned, about 6 minutes. Scrape onto a large plate. Heat 1 Tbs of the peanut oil and add the remaining 1 tsp of grated ginger and stir-fry for 30 seconds. Add the sesame oil and the spicy greens, season with salt and cook until the greens are wilted and just tender, about 4 minutes. 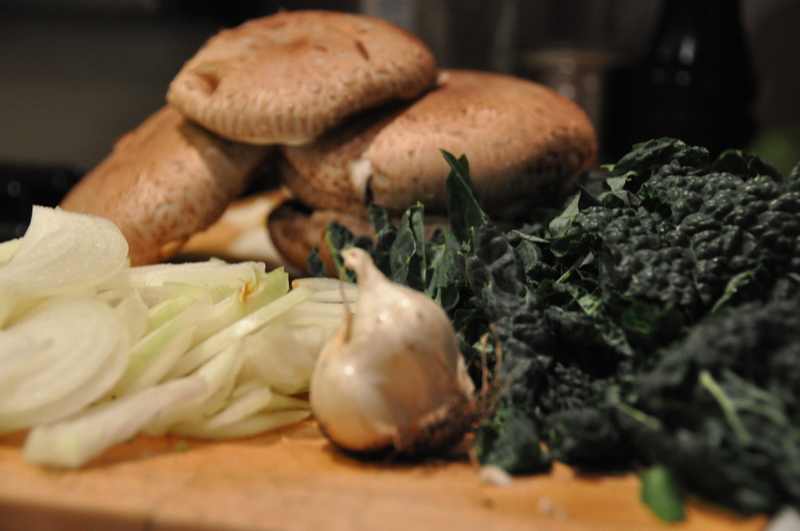 Scrape the greens out onto the plate with the mushrooms, keeping them separated. Heat the remaining 1 Tbs of oil in the skillet, add the zucchini and cook over high heat until softened, about 3 minutes. Add the mixture of soy and molasses and cook until the zucchini is glazed, 2 minutes. Scrape the zucchini onto the platter. Mound the rice into individual bowls, and arrange the cooked vegetables in separate piles. Using a slotted spoon, add the pickled cucumbers to the bowls. Garnish with the scallions and a couple squirts of Sriracha. Serve and enjoy!! 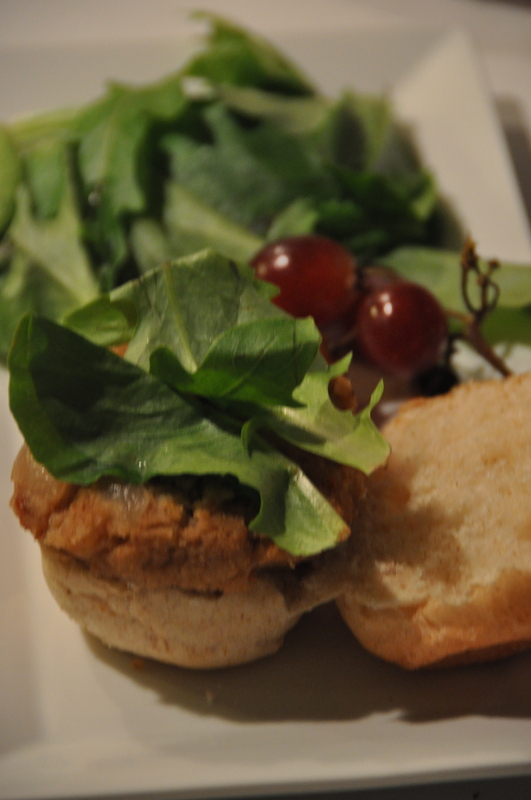 Another fantastic dish that plays with sweet and savory! 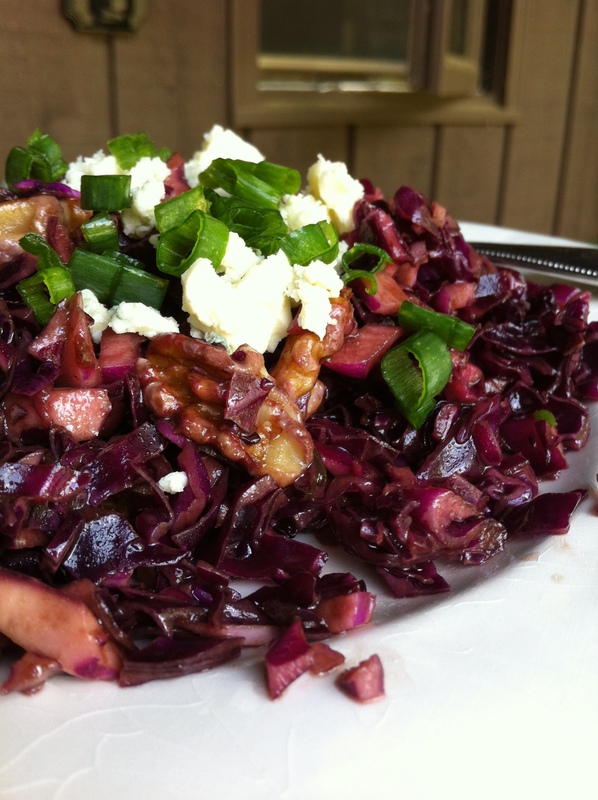 This is a great way to use up your red cabbage and it is easy to prep beforehand. The dressing can be made the night before as well as the toasted nuts. You can also add fresh apples or pears, cut into bite size pieces, to get a seasonal fruit into your diet! To make the dressing, whisk together the walnut oil, vinegar, honey and marmalade in a small bowl and season with salt and pepper. 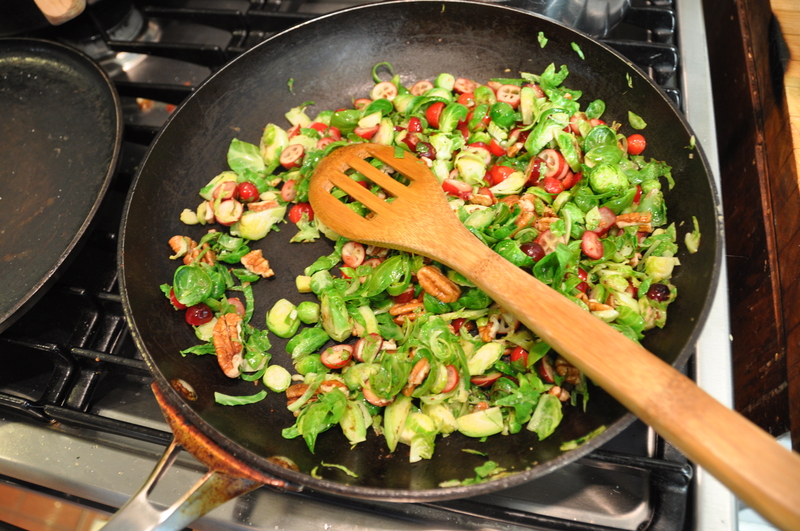 Place the cabbage, dried fruit and nuts in a large bowl, pour the dressing over, and toss to coat. Cover and refrigerate for at least a few hours, or for as long as overnight. Keep in mind that the dried fruit will hydrate a bit so it will be softer and less hard and chewy. I have a funny “texture thing” about partially rehydrated fruit so I always wait until I am ready to serve the dish before adding the dried fruit. That way it remains texturally as I enjoy it most. Place all dressing ingredients into small bowl and whisk until well emulsified. Heat an iron skillet to medium and add the bacon slices. Cook over medium heat until well cooked. Remove the bacon with a slotted spoon and place on a wood cutting board. Set aside till cool enough to chop up into small pieces. Bring a saucepan of water to a boil, and add the beans. Simmer for about 3 minutes or until crisp-tender. Do not overcook! Drain and immediately submerge in the water bath to stop the cooking process. Drain and set aside in a large bowl. Toss the beans with the dressing. 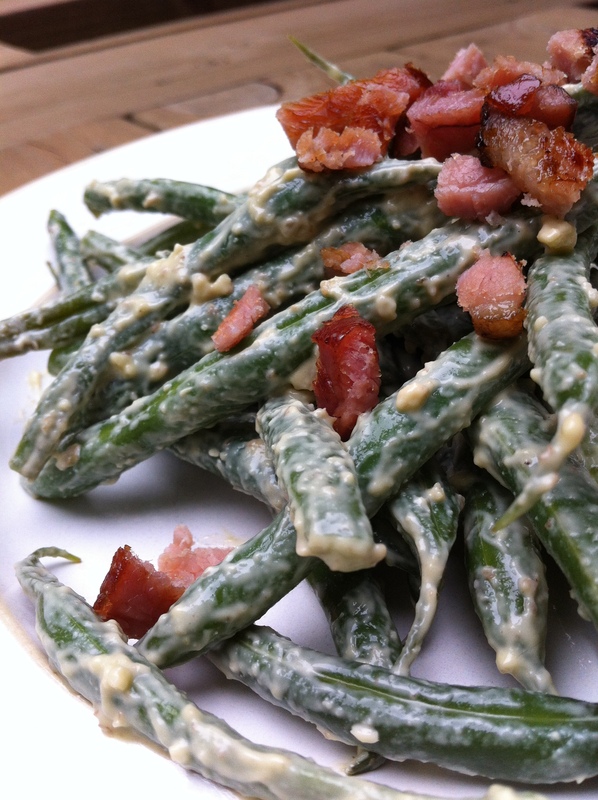 Sprinkle the bacon and blue cheese crumbles on the beans, toss and serve. Who doesn’t love the comfort of a warm, cheesy serving of lasagna? 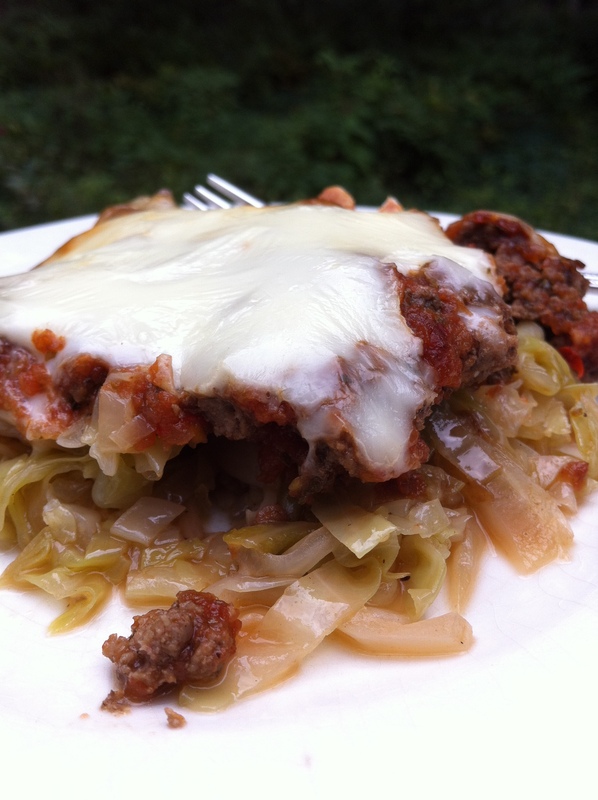 This lasagna dish is sooooo delicious, gluten-free and much lower in calories than the typical pasta recipe. It only takes 30 minutes to bake and the cabbage, sauce and cheese can all be prepped the day before to make assembly a cinch. This recipe is an absolute winner! Heat the butter until melted in a large iron skillet. Add the cabbage and stir to coat with the butter. Cover, lower the heat and cook gently for 5-6 minutes, stirring occasionally until tender. Season lightly with the salt and pepper. Pour into a large rectangular 9″ x 13″ pyrex and spread evenly. Pour the sauce over top and then sprinkle with the mozzarella. Place in preheated oven and back for 25 minutes. In a large saucepan over low heat, melt the coconut oil, add the tarragon and allow to cook for a minute. Add the chopped carrots, cauliflower, curry and pepper, fill with water just until covered. Raise the heat to medium/high and bring to a boil. Lower the heat and simmer 15 minutes, until vegetables are just tender. Turn off the heat and set aside for a couple of minutes to release some heat. VERY CAREFULLY puree in blender until creamy. 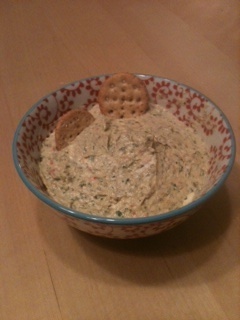 Serve with toasted cashews or a dollop of sour cream and tortillas on the side to dip! Hope you enjoy your veggies this week! http://www.groundswellfarm.org/wp-content/uploads/2018/02/Groundswell-Farms-Logo-v6-1030x321.png 0 0 Steve Whittington http://www.groundswellfarm.org/wp-content/uploads/2018/02/Groundswell-Farms-Logo-v6-1030x321.png Steve Whittington2013-09-15 16:02:362013-09-15 16:02:36The Bibimbap is oh, so Bibimgood! 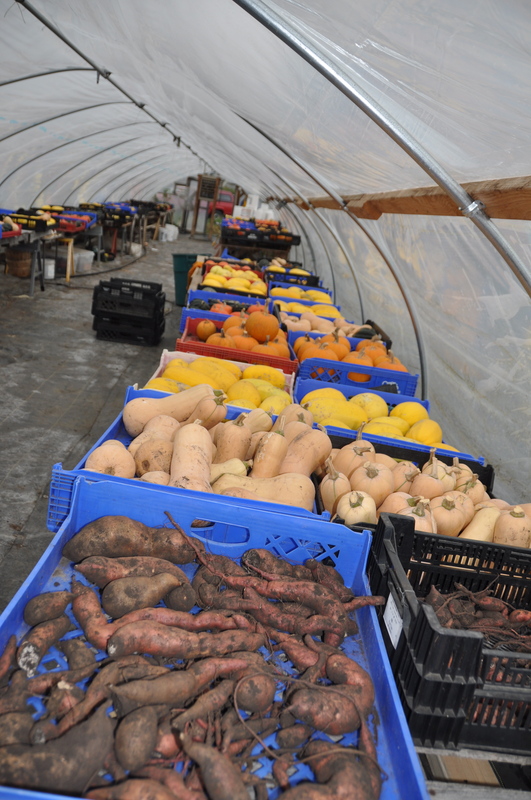 Thanks to Katie, Tom and the most amazing farm crew for the wonderful season of fresh produce! So Here is what we did. Fry a pound of bacon in a cast iron skillet. Remove bacon and 1/2 the bacon fat. Add the leeks, carrots, celeriac and saute for about 5-7 minutes. Add green pepper and broccoli, saute another 2-3 minutes. Add in the par boiled potatoes and beets. Continue cooking and adding oil as needed. Add mushrooms and cook. Fry some eggs in a separate pan. 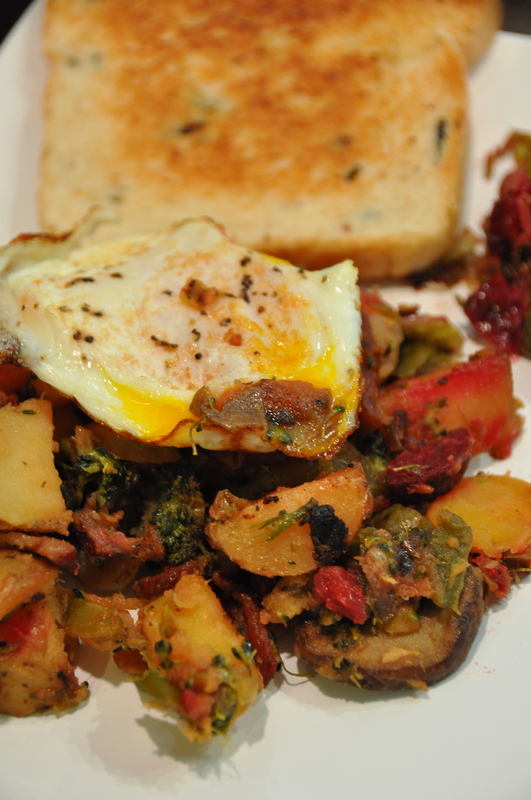 Serve the eggs, with runny yolks over the hash. Serve with your favorite toast and a side of bacon! YUM! In a frying pan coated with olive oil (about 1 Tbsp) add the brussels sprouts and saute over medium high heat a couple minutes. Add the cranberries and continue to cooke a few more minutes. Add the vinegar and stir to combine. Taste for seasonings needed. Add desired amount of sugar (depending on how sour or sweet you’d like this dish, I added 1 tbsp sugar). Toss in the walnuts. Stir. Serve. I have added cooked chicken to this with great results. Heat a large Dutch oven over medium-high heat. Coat pan with olive oil. Add onion and garlic; sauté 3 minutes. Add broth and potato; bring to a boil over medium-high heat. Cover, reduce heat, and simmer 5 minutes or until potato is tender. Combine milk and flour, stirring well with a whisk. Add the milk mixture to potato mixture; cook 5 minutes or until slightly thick, stirring constantly. Remove from heat; add cheese, stirring until cheese melts. Stir in rice, 1-2 cups diced chicken if using, pepper, and salt. Cook lentils in at least 3 cups water. Bring to a boil. Cover and simmer 20-25 minutes, drain. Place celeriac in a saute pan covered with water. Bring to a boil, simmer 15-20 minutes until very tender. Drain. Place the celeriac and 1/2 the lentils in a blender or food processor and puree. In the saute pan, heat olive oil and add diced onion. Saute until just turning brown, about 10 minutes. Add the herbs, salt and pepper. Pour in the red wine and stir until 1/2 has evaporated. Pour this mixture over the lentil celeriac mixture in the bowl. Now add bread crumbs, as many as you need to form a patty. I used 1 1/2 cups. In the saute pan add a tbsp olive oil. Place the patties in the pan and cook a few minutes on each side to brown. Place on an oiled baking sheet. Place the sheet in the oven for 15 minutes, turning once during cooking. Add chicken breasts and cook over medium heat until cooked through. Remove Chicken from the pan and shred. Add the peppers and onions to the pan. Saute until cooked through, but still have a slight bite to them (about 10 minutes). Add seasonings and lime juice and return chicken to the pan, adding more olive oil if needed. Mix all ingredients in a bowl and let sit for at least 30 minutes while making the chicken and pepper filling. 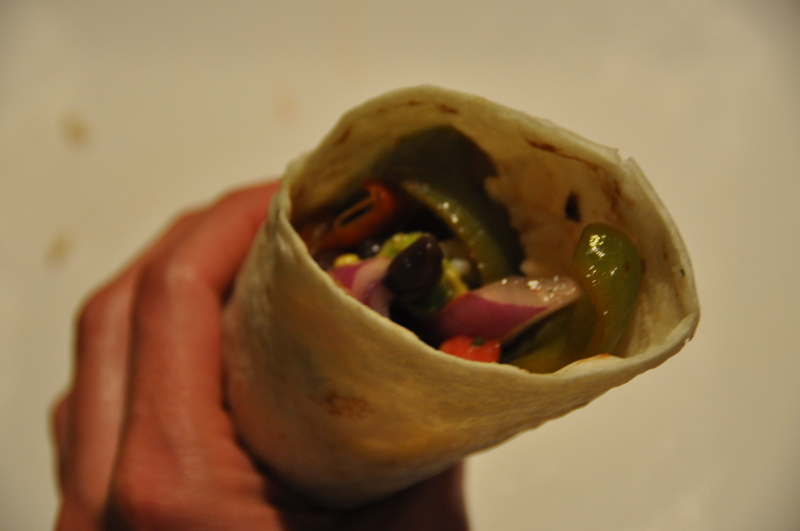 Arrange chicken mixture on a warmed tortilla. Top with Cabbage slaw, cheese and avocado. Great for storing in the freezer. Think pumpkin bread, pumpkin bars, pumpkin pie, pumpkin waffles (see recipe below)…1 large pumpkin makes about 2 cups puree. Cut the pumpkin in half. With a spoon or a scoop, scrape out the seeds and pulp from the center. Place pumpkin pieces on a baking sheet (face up or face down; I’ve done both) and roast in a 350-degree oven for 45 minutes, or until pumpkin is fork-tender. Peel off the skin. 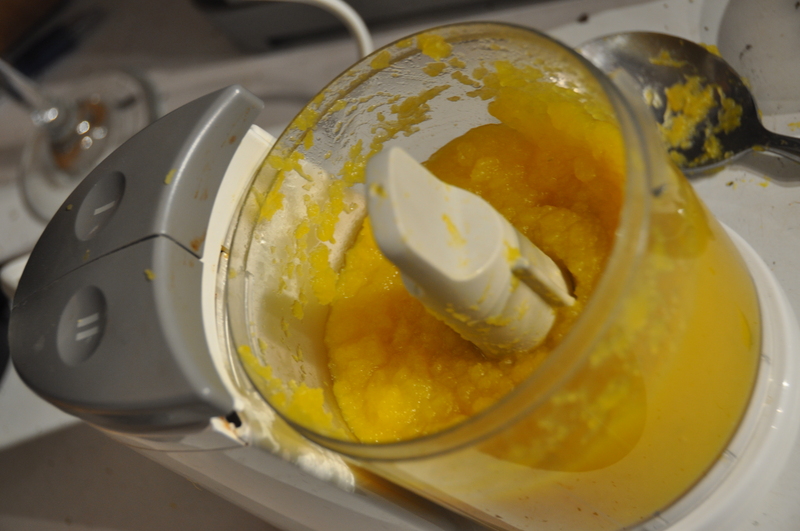 If you have a food processor use it to puree the pumpkin until smooth. You could also use a food mill or blender. Note: this method also works for squash. Combine flour, baking powder, cinnamon, salt, and allspice in a large bowl. In another bowl combine milk, pumpkin, sugar, oil and eggs in a bowl. Add to flour mixture. Stir just until moist. Coat a preheated waffle iron with cooking spray. 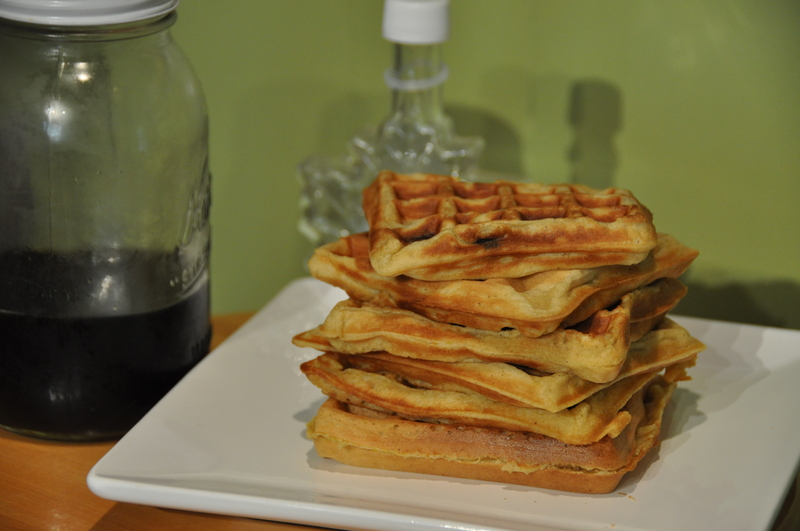 Spoon about 1/4 cup of batter per waffle onto hot iron. Cook 5 to 7 minutes or until green light goes on (as my iron does anyway). Repeat procedure with remaining batter. Suggested additions: I LOVE adding Chocolate Chips to this recipe! Also pureed squash may be substituted. not a meat eater? No worries, sub more vegetables for the pork! Combine cabbage through pork in a bowl. Working with 1 wonton wrapper or egg roll wrapper at a time , spoon about 1 heaping teaspoon filling into the center of each won ton wrapper or about 2heaping teaspoons into center of egg roll wrapper. Follow directions on back of package for folding directions. Place dumpling, seam side up, on a platter. Repeat with remaining filling and wrappers. Heat 2 tsp oil in a large nonstick skillet. 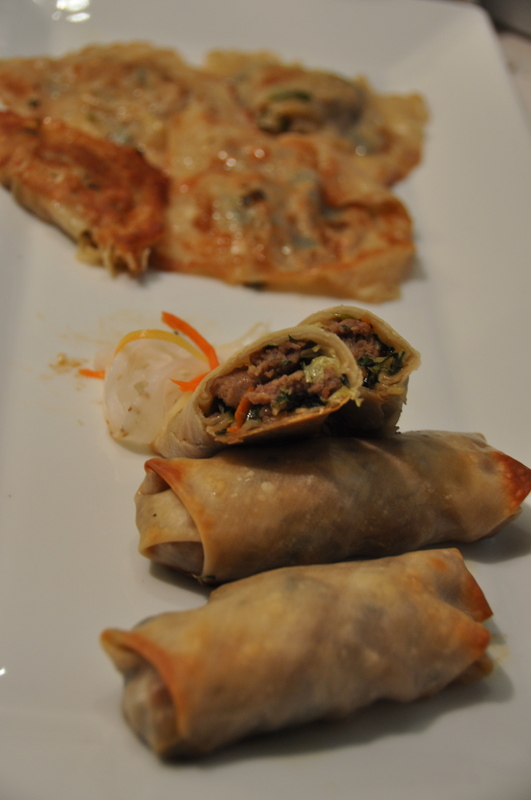 If making egg rolls: In a large saute pan cook filling mixture until meat is cooked through and vegetables have softened a bit but still have a bite. Place egg rolls on a baking sheet brushed with peanut oil. Brush tops of egg rolls with oil also. Bake 12-14 minuted or until golden brown and center is cooked through. Arrange 12 pot stickers, seam sides up, in pan, and cook until browned. 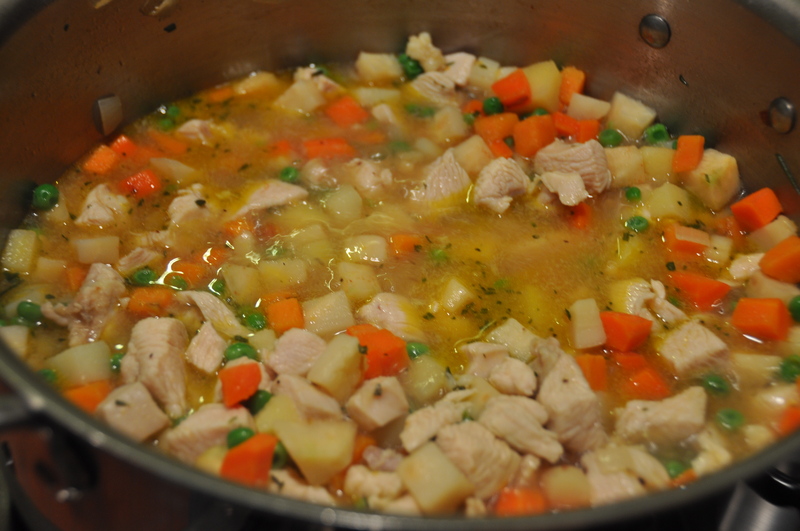 Add 1 cup of chicken broth to pan; cover and cook 5 minutes. Uncover and cook about 1 minute or until liquid evaporates. Remove the pot stickers from pan; cover and keep warm. 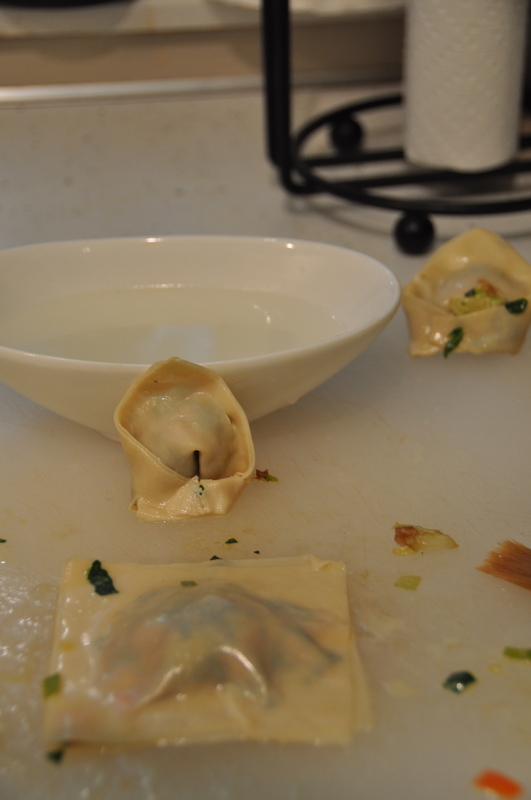 Repeat procedure with the remaining oil, pot stickers, and broth. place the vegetables in a bowl and sprinkle with the salt. let sit for 30 minutes. Strain in a sieve and rinse with cold water. In a half pint mason jar, pack the vegetables and pour 1/4 cup water and 1/4 cup vinegar with 1 tsp-2 tsp sugar. Let stand 1 hour in the fridge. Serve with the pot stickers. Place all in a stock pot. Bring to a simmer (not a rolling boil!). Skim off scum that floats to the top. Simmer 4 hours or until flavors deepen. Strain vegetables and seasonings. Cool. Skim Fat from top. Freeze or use within a few days. Heat oven to 450 degrees. Place vegetables on a baking sheet and drizzle with olive oil. Sprinkle with salt and pepper and rosemary. Cook 45-60 minutes or until vegetables are tender and cooked through. Bring the water to a boil. Slowly rain in the cornmeal, whisking constantly. Simmer over very low heat for 40 minutes, whisking occasionally. When the texture is creamy and the polenta has thickened slightly, stir in cheese and remove from heat. 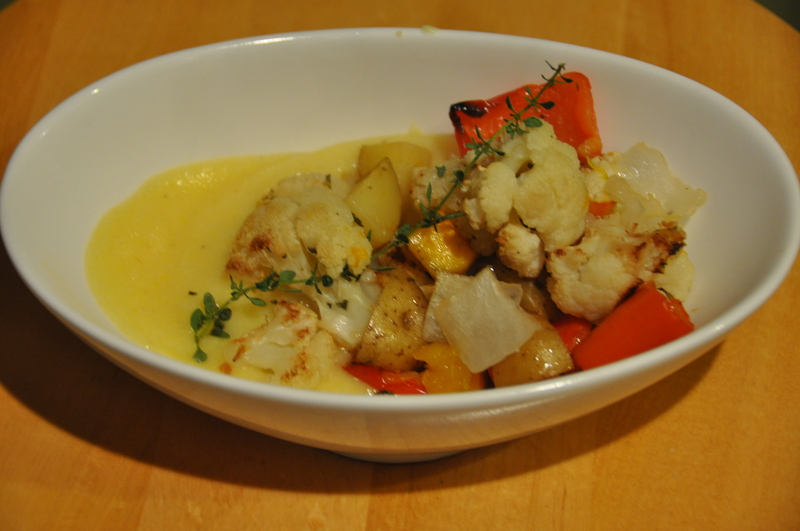 Serve roasted vegetables over the polenta. Great as a side dish or main dish. Great on a toasted bun with a little cream cheese. 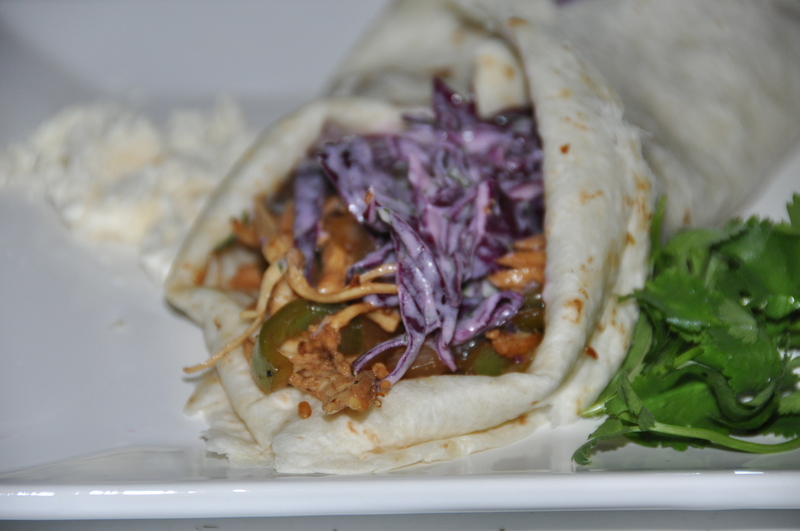 Also great over or under grilled pork or chicken. Heat a tbsp of olive oil in a saute pan. Add the onions and cook until light golden brown over moderate heat for about 15 minutes. Add the mushrooms and cook until they start to release their juice (about 4-5 minutes). Add the kale and saute another 5 minutes or until the wilted. Sprinkle in sauces and brown sugar and salt. Stir and adjust seasoning. 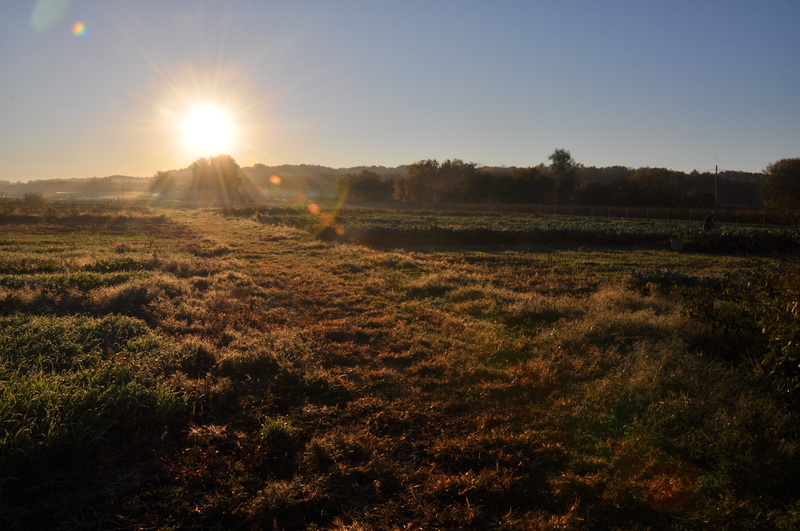 Enjoy this post from our Groundswell Community Farm Cookbook. The pictures were taken last year in October. Celeriac, or celery root, has a nice, mild celery flavor with a typical root texture. Cut in matchsticks for a French cuisine inspired coleslaw! Celeriac is often used baked and pureed in soups or mashed with potatoes. 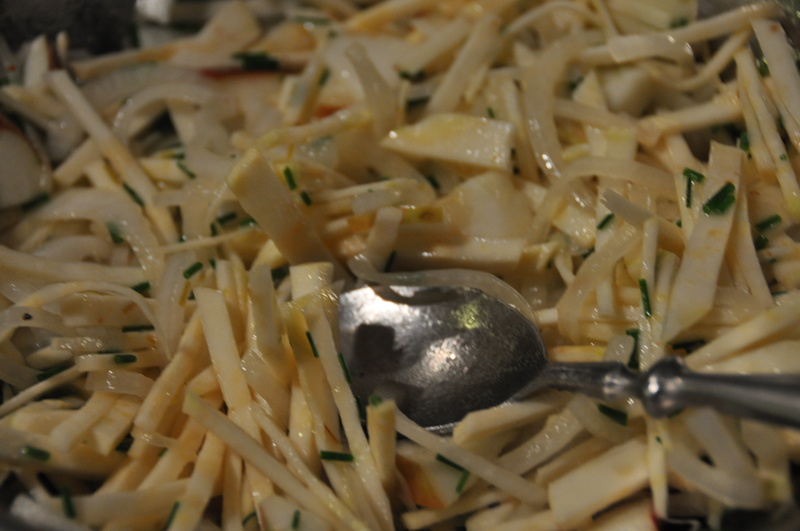 I also enjoy celeriac stir-fried and grated raw in salads. fridge. These also keep for months in a root cellar. I’ve heard this dish is also excellent with kohlrabi. 1. This beats plain old mashed potatoes any day. Cover the celery root pieces with cold water, bring to a boil and cook until very tender, about 30 minutes. 2. Cut up the butter and place in the bottom of a large bowl. Scoop out potato flesh or put whole potatoes in the bowl. Add the celery root and garlic, and mash all together. Add cream to get desired consistency. If you want your puree really smooth, you may mix with a handheld blender. Season to taste. 3. Serve immediately or transfer to a buttered ovenproof dish and keep warm in the oven. minutes (time depends on the kind and age of the rice). 2. Stir in dried cranberries; cook until rice is tender, 5-15 minutes longer. Makes 4 servings. in soup stocks, and potato salads. Celery has also found popularity with those who juice and with those who diet. I toss it in with stir-fries or make a batch of cream of celery soup that I can’t stop eating. Celery leaves add a lot of flavor to soup and stock and can be used in moderation in salads. 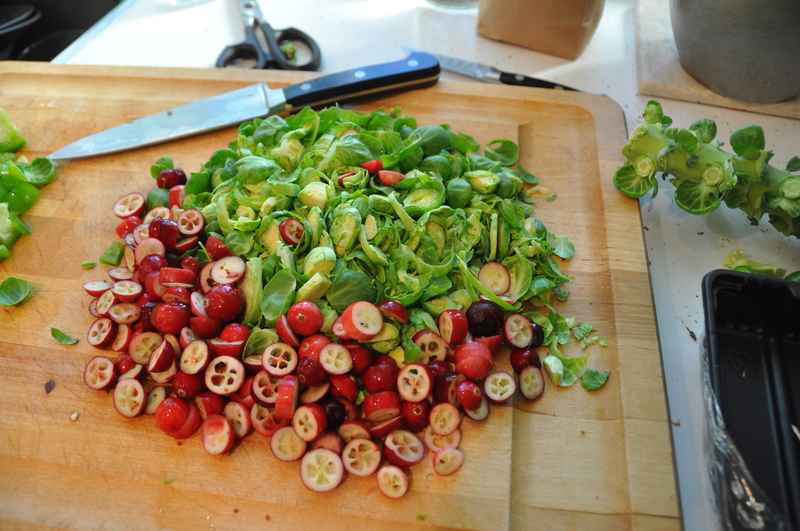 store the leaves, dry in a food dehydrator, in a warm oven or on a clean window screen in the sun. Then store in a Ziploc baggie. If you ever have problems with grain moths, store all your dehydrated foods in glass jars, as they will cut right through plastic bags. potato soup, pot pie or shepherds pie. Leeks are also good in sautés and non-potato soups. To use, remove all dark green leaf layers from the tops and outside. Rinse off the whole leek, then slit lengthwise and rinse out all layers that show indications of soil. You can use some of the light green leaf sheathes, but bite into a few to be sure they are not tough. keep for weeks without a problem. For long-term storage and for easier use in the winter, steam or simmer leaks until tender then cool and freeze in a freezer bag. Ahh parsnips… We hope you enjoy this delicately sweet root as much as we do! Bake them, boil them, fry them, grill them or eat them raw; delicious every time. 1. Preheat the oven to 425 F. Lightly oil a 9X13-inch baking dish. 2. In a large bowl, combine the parsnips, oil, rosemary and salt and pepper to taste. Toss to coat. Arrange in a single layer in the baking dish. Believed to be a hybrid of the turnip and cabbage, the rutabaga was one of the first vegetables grown by colonists in the Americas- the large root helped break up the untilled soil. Not very popular here now but it is such a versatile vegetable with high nutrient value. Heat oven to 500F. Cut ends off rutabagas and peel them Use a heavy sharp knife to cut each rutabaga in half lengthwise, then cut each half into 3-4 wedges. Place wedges in very large baking pan and toss with olive oil to coat them well. Spread them out into a single layer and try to keep them from touching one another. Roast in hot oven 20 minutes. Use tongs to turn each wedge over. Roast another 15-20 minutes. Remove from oven and toss with balsamic vinegar and salt to taste. Serve hot. This “hot-oven” approach to roasting is credited to cookbook author Barbara Kafka. Makes 6-8 servings. Yum! Baked with butter, in soups, in breads, marinated in salads- all good! 1. 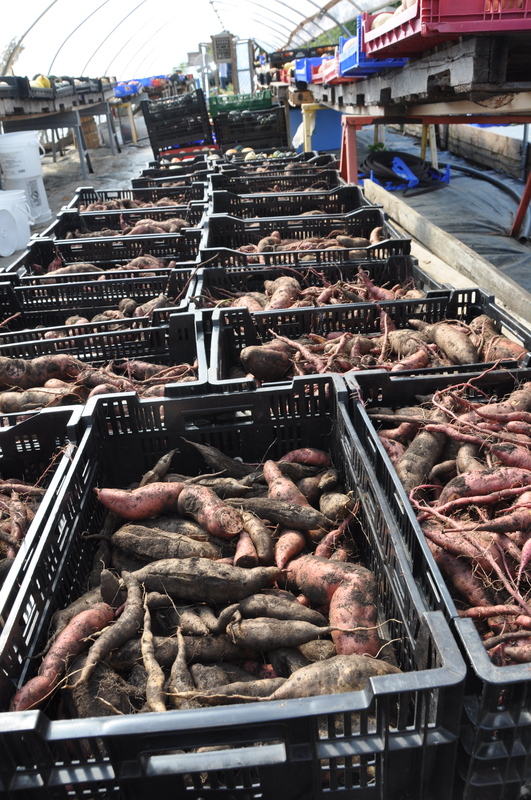 Preheat the oven to 400 F. Scrub the sweet potatoes and cut them lengthwise into quarters or halves. Place them in a baking dish roomy enough to hold them in a single layer. 1. Combine flour, sugar, yeast, salt and spices in a large bowl. 3. Add egg to mixture and beat at medium speed for 3 minutes. bowl, turn to grease both sides, cover with a damp cloth, and let rise until doubled in bulk. Punch down dough and divide it in half. Roll each half of dough on lightly floured surface into a 12-inch circle. baking sheet. Cover and let rise until doubled. What a delightful substitute for pasta in spaghetti. Also great as a side dish with butter, salt and pepper. sprinkle with garlic powder, salt, and fresh ground black pepper. 2. Let it bake at 400 degrees for 25 minutes (more or less depending on the size of your squash). can be used as a side dish or as the meal with French bread garlic toast! Recipe Note: Add Italian seasoning and Parmesan cheese, when serving it with Italian foods. Other combinations: add curry powder and cumin or fresh garlic and fresh basil. 1. 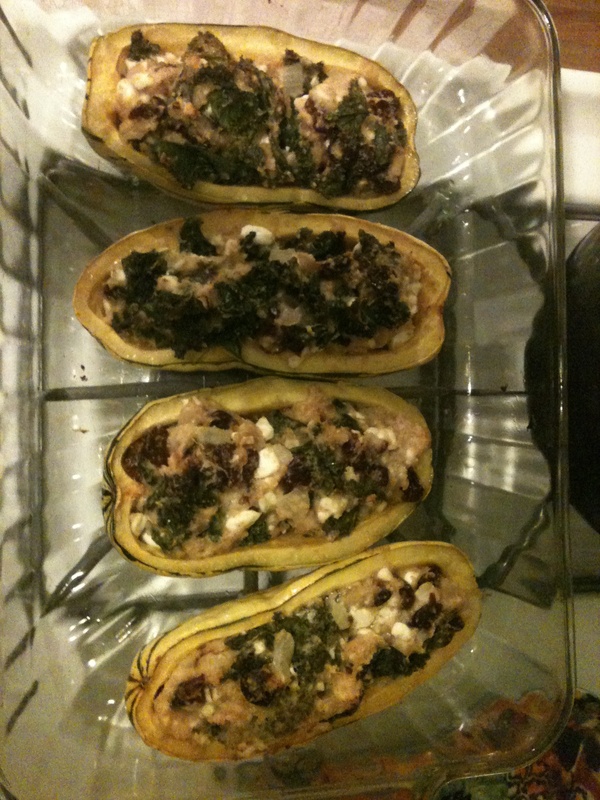 Prep your spaghetti squash and then set oven to 350 F.
2. Sauté onion in olive oil until soft. Add tomato, garlic, thyme and basil and cook gently until most of the liquid is absorbed. 4. Mix parsley, bread crumbs and Parmesan cheese and spread on top. Drizzle with melted butter. 5. Bake at 350 F for ~ ½ hour or until most of the liquid is absorbed. I never knew what a versatile vegetable squash was until I found myself with a closet full of all kinds last winter- I had to be creative! Squash can be found to take on sweet, spicy, or buttery characteristics in recipes. I remember eating squash as a kid, hoping to get some of the brown sugar and butter floating in the middle. Now I usually puree it for soups, casseroles, and pies. 1. Cut and quarter the butternut and steam for 20 minutes, or use pulp from leftover baked squash. Meanwhile, toast the tortillas over a gas burner or on a griddle till softly crisp. Remove the squash pulp from the skins. 3. Place squash on tortillas, sprinkle with shredded cheese and place under broiler or in oven until cheese melts. 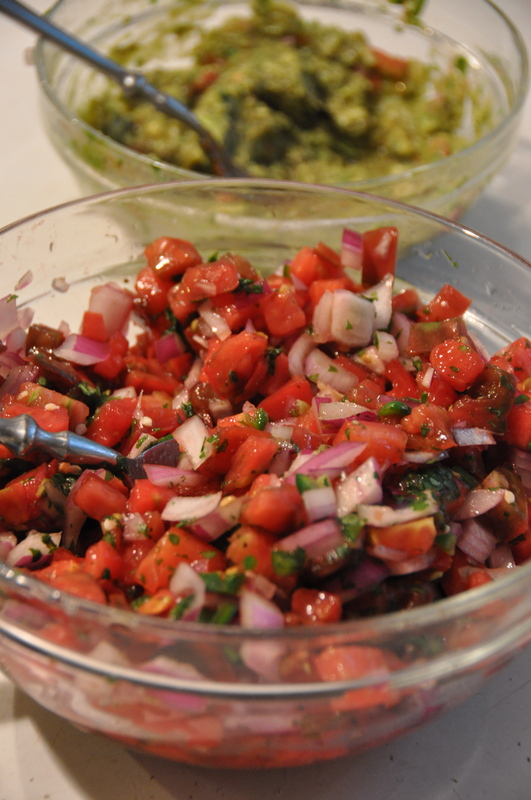 Remove, cover with lettuce and dot with salsa. A handful of toasted pumpkin seeds make a delicious final touch. 1. Place mashed or pureed squash on a large bowl. heat for about 5 minutes. Add salt and bell peppers. Sauté about five more minutes, or until the peppers begin to get soft. 3. Add garlic, black pepper, and cayenne, and sauté a few more minutes. 5. Bake uncovered for 25 to 30 minutes, or until bubbly. 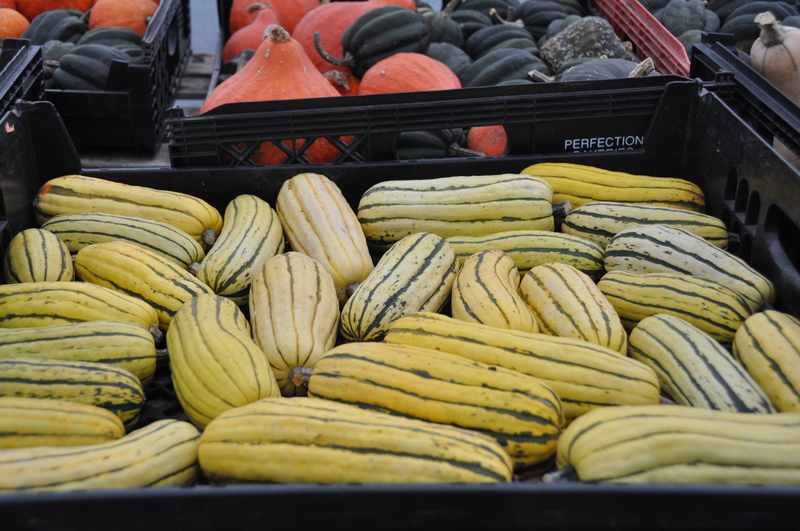 Use acorn squash, delicata, Lady Godiva, or any other small variety of squash. A handsome colorful presentation. Serves 4 to 6 depending on size of squash. ½ to 1 cup whole wheat bread crumbs. 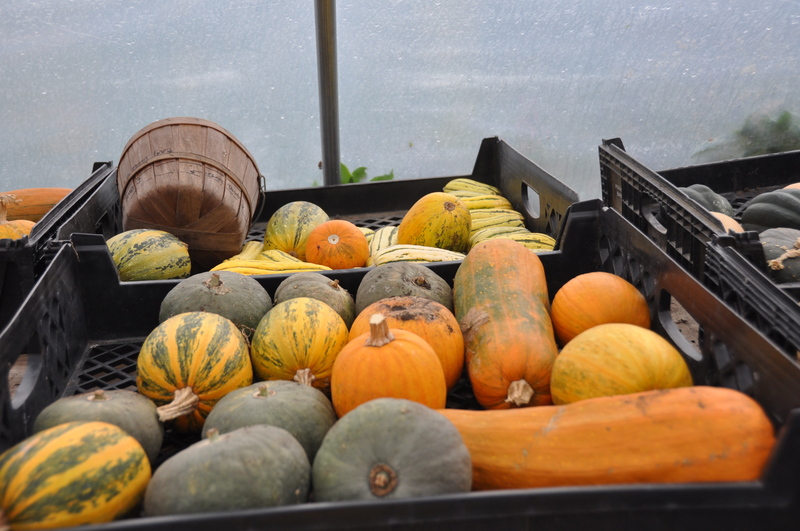 will depend on which squash you choose. 2. Meantime, sauté onions in oil until soft. Add chopped celery. Cover and simmer on medium heat until just tender. Add spinach; stir to wilt. (if using kale add just before celery and chop small to avoid chewiness). 3. Stuff squashes with vegetable mixture. Sprinkle with salted bread crumbs. minutes. Add basil, oregano and pepper when you turn off the heat. 3. Meanwhile, start boiling water for the lasagna. Cook noodles until they bend but not until they are fully cooked. Be sure to use plenty of water and stir the noodles so they don’t stick together. 4. Get a large, deep Pyrex pan or metal cake pan and spread a ½ cup of liquid from the tomato sauce in the bottom. Lay out all of the remaining ingredients. 5. Over the liquid on the bottom of the pan, spread a layer of noodles so the entire pan is covered. Next spread 2 cups of winter squash and ½ of your ricotta cheese. Add another layer of noodles, the remainder of your squash and ricotta, 1/3 of your tomato sauce and 1/3 of your mozzarella. Add another layer of noodles, 1/3 of your tomatoes and 1/3 of your mozzarella. Add a final layer of noodles, the remainder of your tomatoes and mozzarella, then all of your Romano cheese. 6. Bake for ~50 minutes or until the cheese is golden brown. Great for leftover baked squash! 2. Sauté the onion in the oil. When the onion is golden, add the parsley. Cook just long enough to soften the parsley; then combine with squash and add salt. Bring the soup to a simmer—don’t boil or it will stick. chopped bite-size. Makes about 7 cups. 2. In a large bowl, beat the butter until fluffy. Slowly beat in the sugar until mixed. Add the eggs, one at a time, beating after each addition. Add the squash and apple cider and beat until well mixed. 3. Sift together the flour, baking soda, salt, cinnamon, nutmeg, cloves and ginger. Add the creamed mixture in 3 batches, beating well after each addition. 4. Pour into the pan and bake for 45 minutes, or until a knife inserted in the center comes out clean. Remove and cool for 10 minutes, then turn the cake out onto a wire rack to cool completely. 1. Oil two 5×9-inch bread pans. 2. Proof the yeast by sprinkling it over ½ cup of warm water and adding a teaspoon of molasses. Stir and let sit about five minutes or until yeast begins to foam. 3. In a large bowl, combine 1½ cups of hot water with the molasses, oil, salt, dill, caraway seeds and grated vegetables. Cool to lukewarm. remaining white flour to make a stiff dough. Turn the dough onto a floured surface and knead it for 10 to 15 minutes. 5. Place the dough in an oiled bowl, turn it to coat all sides with oil, cover it with a cloth and allow it to rise for about 1½ hours. Punch down the dough and let it rise again for about 1 hour. Shape the dough into two loaves and place them in oiled bread pans. Cover the loaves and allow them to rise for about 45 minutes. 6. Bake in a preheated oven at 375 F for 35 to 40 minutes. Grated Veggies: Carrots with any combination Celeriac, Beets, Kohlrabi, Cabbage, etc. nuts. Walnuts are great for this. 1. Steam kale until nearly tender. It may take more or less time than the rest of the recipe ingredients, depending on whether it is tender or tough; if it cooks quickly, take it off earlier. You should have about 2 cups. Drain well. While kale is cooking, peel roots and dice in ½ inch cubes. 2. Sauté onion, garlic, and celery in olive oil. Mash the garlic cloves with a fork and add the remaining sauce ingredients, as well as the parsnips, rutabaga, and turnip or beet. Simmer 10 minutes. (Adjust the amount of stock to suit the way you will be serving the stew.) Simmer until parsnips etc. are nearly tender, about 20 minutes. Add kale and cook briefly, until everything is tender. Serve with grain, potatoes or hot rolls. 1. Preheat oven to 425 F. Lightly oil a large shallow roasting or half sheet pan. wine. Stir with the fork until creamy. to mix. Season generously with salt and pepper. Serve at once. 1 cup leftover vegetable puree or mashed vegetables, such as winter squash, potatoes, etc. onion, egg and flour and season to taste. and sauté pancakes until golden. Turn and sauté other side until golden. 3. Eat immediately or remove to a heated platter or warm oven until ready to serve. Sprinkle grated cheese on top if desired. From Vegetable Main Dishes “You have considerable leeway in assembling the ingredients for this English-inspired meal in a dish, but there should always be carrots, onions, and at least three other vegetables, one of them green. Leftover mashed potatoes work fine to top the vegetable stew, which can be browned under the broiler or in a hot oven. Serves 4. 2 pounds baking potatoes (about 4), peeled or scrubbed and cut into large pieces. incorporating the cream and 4 T. of the butter. Cover and set aside. tsp. each of salt and pepper. Mix well. remains in the pan, about 10 minutes longer. over the top, and cook until lightly browned, about 5 minutes. Preheat oven to 400 degrees. 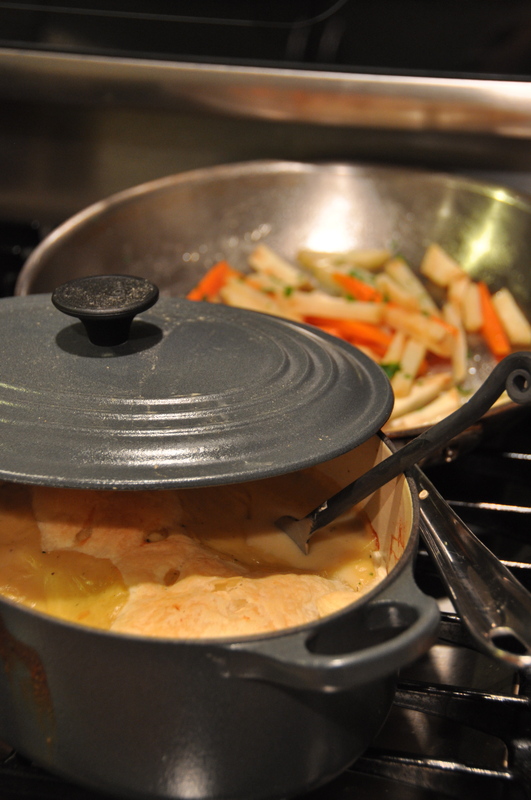 Coat a large pot or dutch oven with olive oil. Add chopped vegetables and cook 5 minutes. Pour in broth and bring to a simmer. Cook until the vegetables are beginning to soften. Add the peas, rosemary and chicken. Cook until the chicken is cooked through. You may stop now and remove 1/2 as soup or keep going and make 2 pot pies. Slowly whisk the milk into the flour in a separate bowl until well incorporated. Pour this mixture into the pot slowly, stirring as you pour. The sauce will thicken quickly. Remove from heat. Pour into 2 11×7 dishes. Roll out puff pastry until thin enough to cover inside of both pans. Place puff pastry over the pans and tuck in. Slash the puff pastry with a sharp knife to vent. Cook for 20 minutes or until pastry is golden brown. Place all ingredients in a fry pan. Pour enough water in to 1/2 way up the matchsticks. Heat over medium low heat, swirling the pan occasionally until all water is absorbed and the vegetables are tender and glazed in the butter and sugar (about 10-15 minutes). 2 Celeraic, peeled and cut into matchstick pieces. Place the Celeraic and onion in a medium sized bowl. Add the apple cider vinegar and let sit about 10 minutes (or up to 2 hours). Add the apple and chives. Stir. Whisk the olive oil and mustard in a small bowl until emulsified. Stir into the salad until all is incorporated. Great right away, even better the next day. My new favorite way to eat celeraic! Saute the peppers in a pan with olive oil, salt and pepper. Add in the mushrooms and cook until to desired of doneness on the peppers. Heat a grill or grill pan over high heat. Add the steak in batches and cook 2-4 minutes for mid rare. Slather the bun with caramelized onion and place under broiler for a minutes to toast (watch carefully!). Pile on the peppers and steak. Pour on the cheese sauce. No knife and fork allowed! You must eat this by picking the whole darn thing up and letting it slop all over your plate! Melt the butter in a sauce pan. Add the flour and stir for about 2 minutes to cook the flour a bit. Slowly whisk in the milk and bring to a simmer. Let the sauce thicken (will take about 5 minutes). Add the cheese and stir until it is melted. Place all ingredients in a Slow Cooker (aka Crock Pot) on Low setting for 7 hours. Done! Serve over bread, mashed potatoes, egg noodles, polenta…. Admittedly, this fell just a little flat on flavor. We agreed next time, browning the meat before placing in the crock pot and some cooked bacon would be a good addition along with a dollop of homemade ketchup (see previous post). In a large fry pan melt butter and add olive oil. Add fennel and onion and cook over medium low heat stirring occasionally until nice golden brown (about 20 minutes). In a bowl toss the potatoes with the cream and cheese. Add in caramelized veg and salt/pepper to taste. 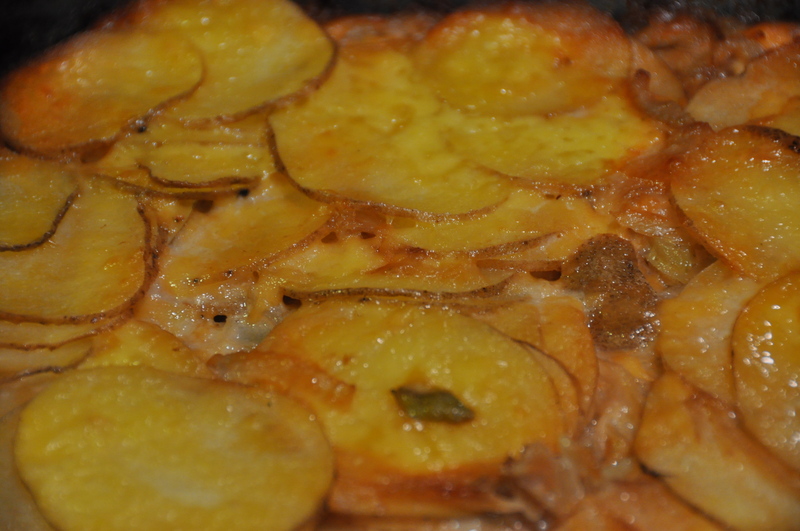 Place the potatoes in a 9×13 pan. Grate more cheese on top if desired. Cover top with foil. Bake in a 400 degree oven until tender when pierced with a fork. Remove foil and let the cheese brown on the top. Enjoy! This is one of my favorite fall recipes. Great served with a holiday meal! Mix and Match your veg in this salad. Use celeraic if you have it or daikon. Place all ingredients in a pan (except beet which should already be cooked). Bring to a boil and simmer stirring occasionally until a syrup forms and vegetables are tender. Strain cooked vegetables and arrange on a platter with the beets. Drizzle with most of the dressing. Sprinkle with raw veg. Serve. 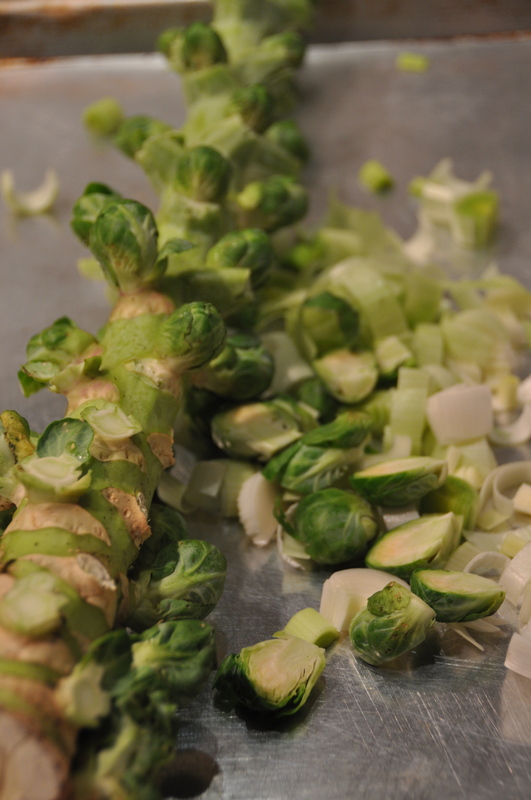 Toss the brussel sprouts, leeks and garlic cloves in a bowl with enough olive oil to coat (about 2 Tbsp). Sprinkle with salt and pepper. Place in a single layer on a baking pan. Place pan in a 450 degree oven. About 15 minute total cooking time…Now, you need to check these frequently because the top layers of the brussels will turn from golden to burnt in a matter of minutes at the end (and the garlic will go fast at the end as well). I like to enjoy the first crunchy layer of leaves from the brussels myself then place the pan back in the oven to cook them a little longer. Thanks to Tom, Katie and the farm crew for all the lovely produce this week! Quarter the tomatoes, place in strainer and allow to drain for a few hours to release excess water. 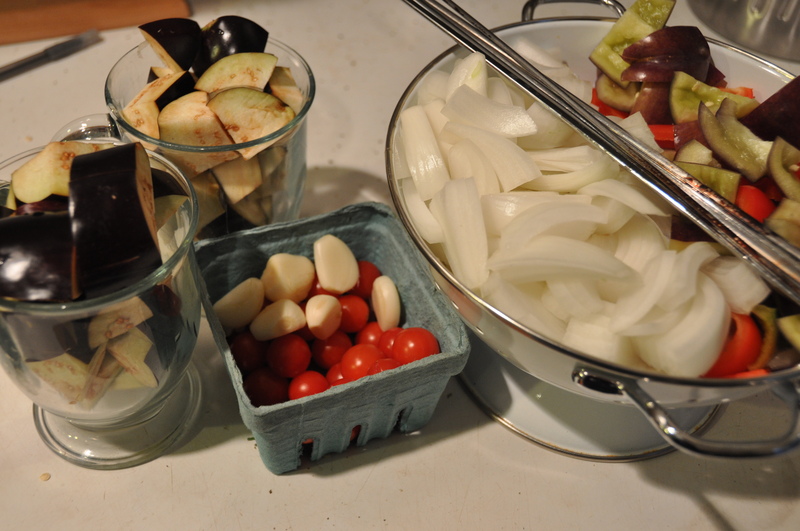 Place tomatoes, onions, bell pepper and garlic in a large pot. Bring to boil over high heat. Reduce heat to medium-low and simmer, stirring occasionally, until vegetables are very soft about 30 minutes. Pass through a food mill 2 or 3 times starting with a course blade and working to the finest blade until you have a very smooth puree. Alternatively, puree in a blender until smooth and pass through a fine strainer into a large bowl. Place peppercorns through bay leaves on a piece of cheesecloth and tie it up to form a bag. Add to tomato mixture along with brown sugar, paprika, vinegar, salt and cayenne. Simmer slowly stirring frequently until ketchup is very thick, at least 2 hours. Remove cheesecloth bag. 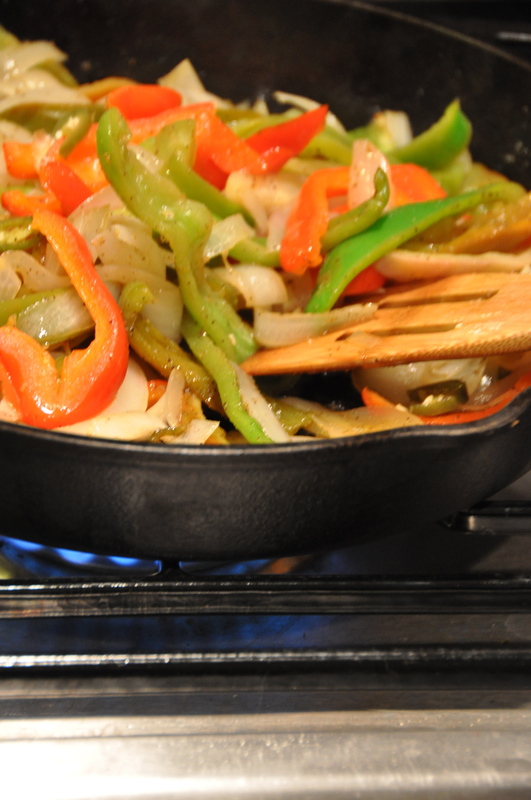 In a large frying pan coated with oil, add the peppers and onion. Cook over medium high heat until nearing the desired degree of doneness. Add the limes and fajitas seasoning, stir. Add the steak and mushrooms and more seasoning if desired. Saute until the meat is cooked to the desired degree of doneness. 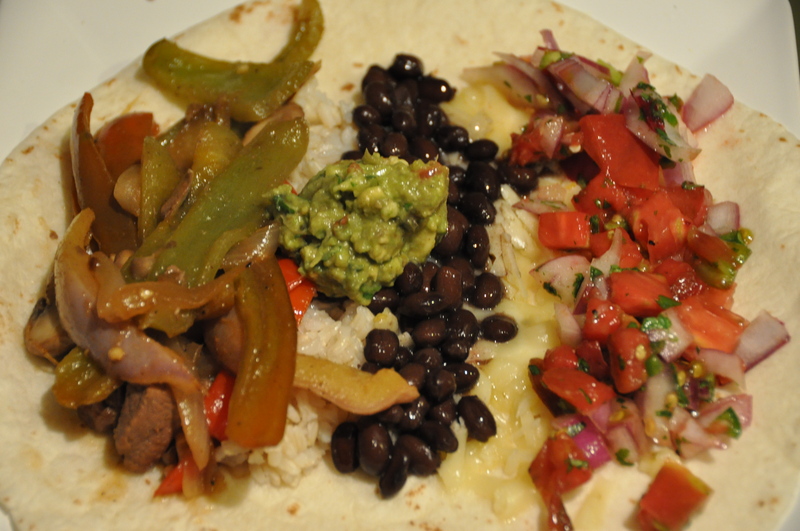 Take a warmed flour tortilla and load it up with rice, beans, pepper and steak filling, toppings and roll it up like a Burritos (good luck with not filling it entirely too full!). Heat a large Dutch oven over medium-high heat. Coat pan with olive oil. Sprinkle lamb with salt and pepper. Add lamb to pan, and cook on each side or until browned (about 5 minutes per side). Remove from pan. Add garlic to pan; sauté 15 seconds. Add wine; cook 2 minutes, scraping pan to loosen browned bits. Stir in tomatoes; cook 2 minutes. 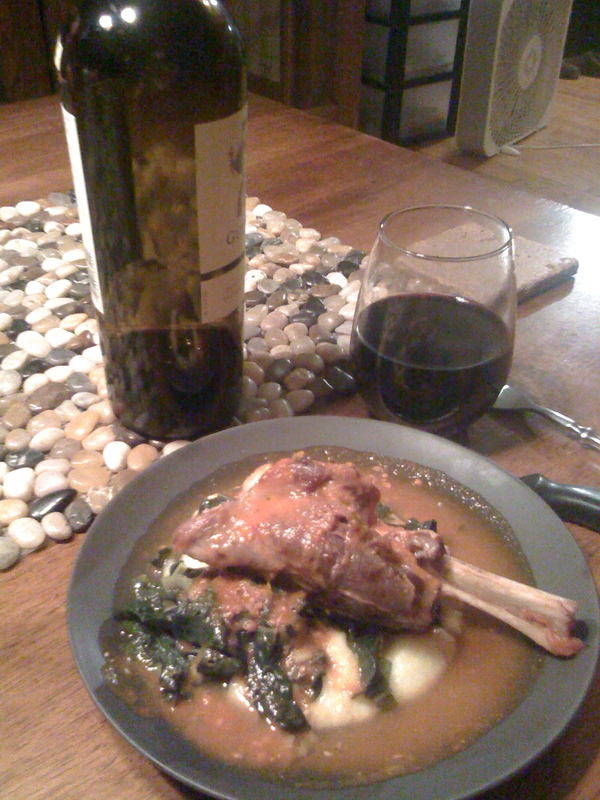 Return lamb to pan. Cover, reduce heat, and simmer 1 hour. Turn lamb over; simmer 1 hour or until meat is done and very tender. Place lamb on a plate; cover loosely with foil. Add butter and sugar as desired and bring sauce to a boil, cook 10 minutes or until thickened. If you want a smooth sauce, use an immersion blender or pour the sauce into a blender and puree (be careful for the steam and only put small amounts in the blender at a time). Return lamb to pan; cook until lamb is thoroughly heated. Stir in parsley. Serve over polenta with boiled greens. While the lamb is simmering, start your polenta. Bring water to a boil and slowly rain in the polenta, whisking constantly. 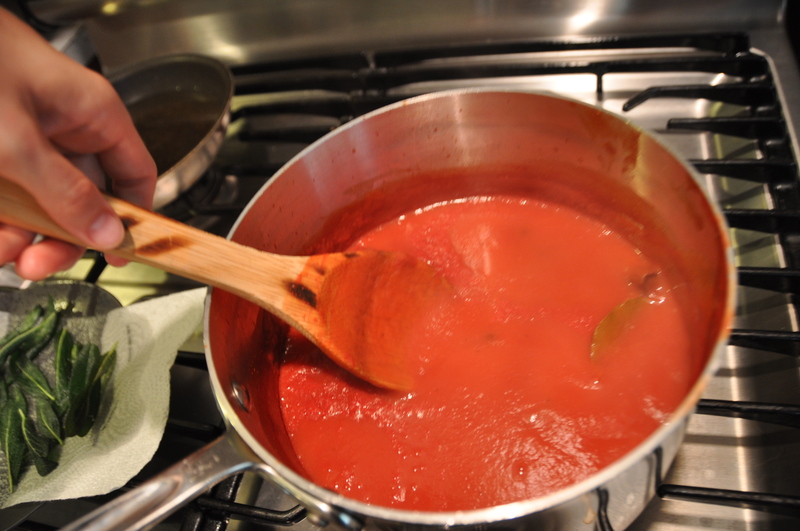 As the sauce starts to thicken, switch to a wooden spoon. Simmer on a very gentle heat for 30 minutes (I turn the burner on low and move the pan to the side of the burner so part of it is off), stir occasionally. Start a double boiler with about 1.5 inches of simmering water. Transfer the polenta to the double boiler, place a piece of parchment paper directly on the surface (to stop the formation of a crust). Leave over simmering water for 45 min-1 hour. I like to use a bunch of mustard greens, thick stems removed and large sliced. you could also sub kale or collard greens. Coat a medium sized sauce pan with olive oil. Add onion and saute for 5 minutes or until cooked. Add garlic and mustard seeds. Saute 2 minutes. Add greens and saute until just beginning to wilt. No add about 1 cup water or until just barely covering the greens. Cover and simmer 30 minutes. Use a slotted spoon or tongs to remove the greens from any remaining liquid. Sometimes I like to make boiled greens, mix them with a little stone ground mustard and serve them over grilled brats. Par boil the potatoes. Place in boiling water for 5 minutes (so they are not cooked through but begining to soften). Start your fire and get it nice and hot. Alternate the ingredients on a skewer. 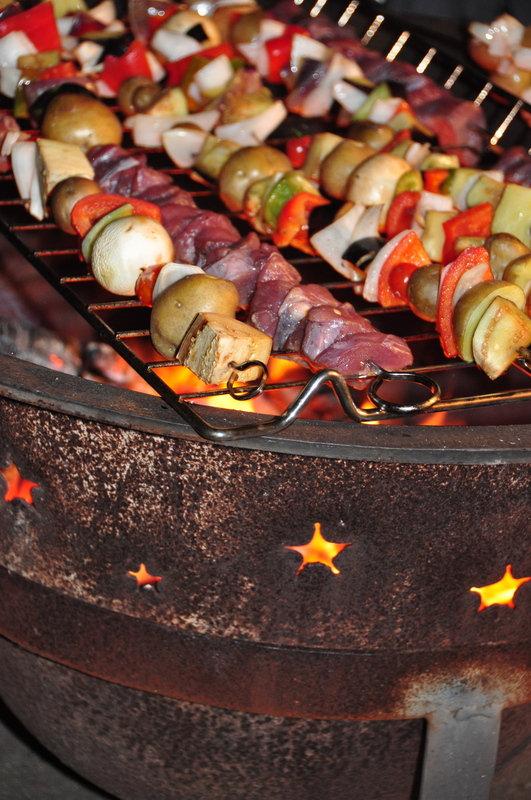 Place skewer over a grill grate placed on the fire pit. Cooke until desired degree of doneness, flipping the skewer a few times during cooking for even heat. Serve with homemade ketchup from above. Also good with beef, cubed and marinated in a little red wine and olive oil. 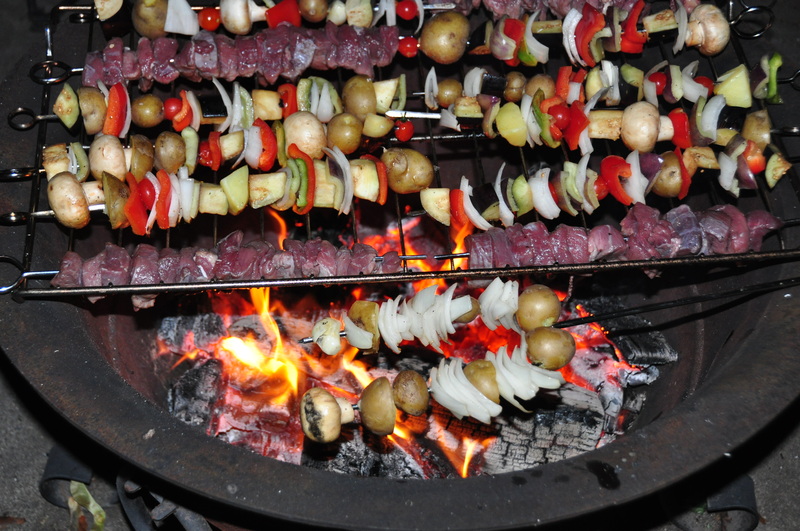 I usually place the meat on a separate skewer as the cooking time is different from the vegetables. Combine broth, bulgar, raisins, tomatoes in a medium saucepan. Bring to a boil. Cover and simmer 15-20 minutes until liquid is absorbed. Remove from heat. Serve warm or cold. I always have a jar of tahini sauce hanging out in the fridge. This is a great use for it! Preheat oven to 450 degreed. 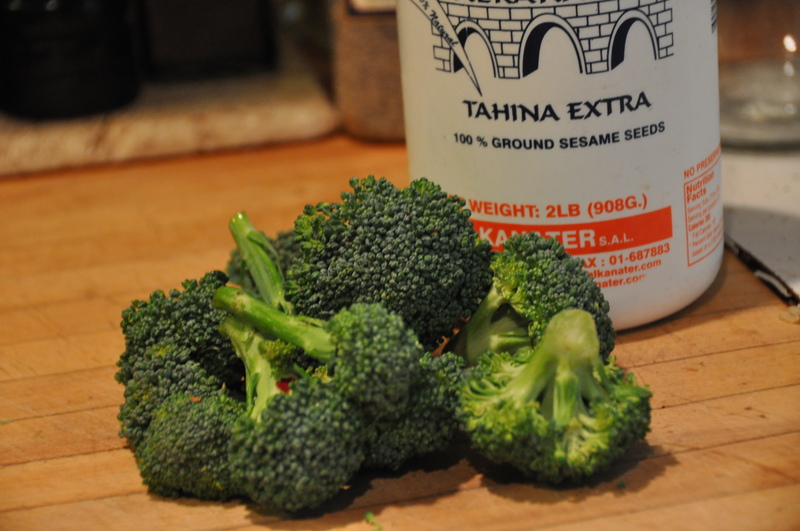 Toss broccoli w/ 1 tbsp olive oil, salt, and pepper. Spread on baking sheet, roast 15-20 minutes until florets start to brown. Heat remaining tbsp oil in sautee pan over medium heat. Add garlic and sautee 1 minute. Stir in tahini and 1/3 cup water. Simmer 1 minute until starts to thicken. Remove from heat, stir in lemon juice. Toss with hot broccoli.